I have a more minimalist taste when it comes to jewelry. 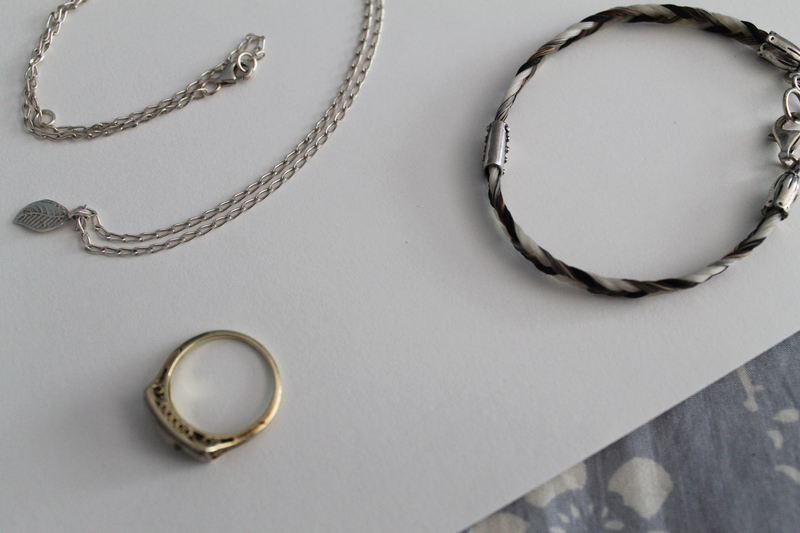 One of my friends laughed that I liked simple silver jewelry, so that was her go to for my birthday. I’m glad I have people on board because my jewelry needs are a little tight. I’m allergic to almost all metals! 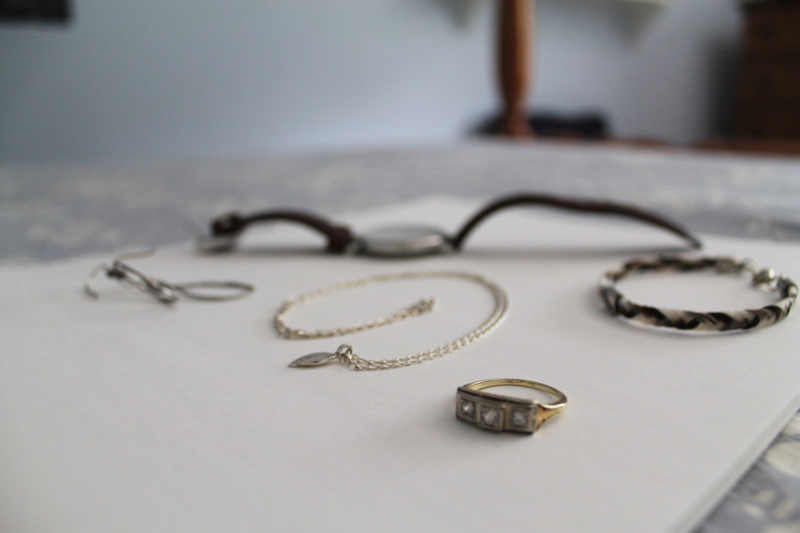 All my jewelry has to be silver or gold- the good news is I like silver more than gold and it’s cheaper. So what are my go to’s? A simple one charm necklace that hits right below the collarbone: The one I used in the image is a little leaf, which is my current favorite. 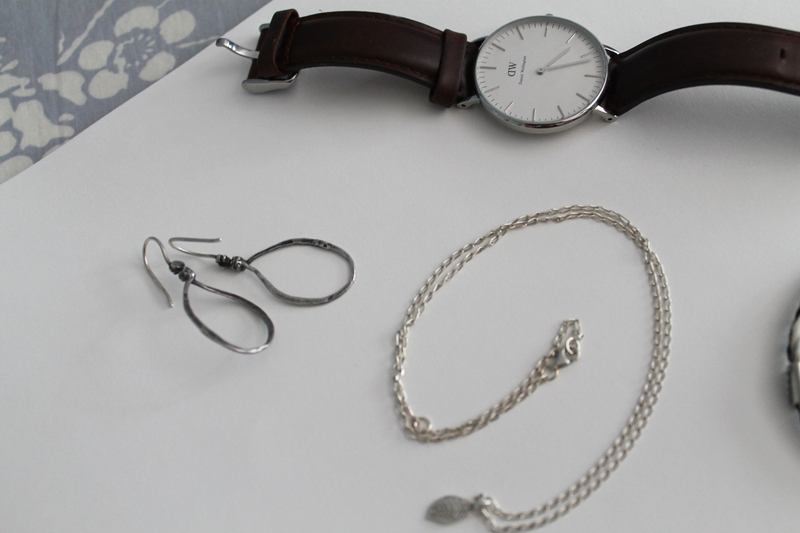 Small understated jewelry gives your outfit interest without it being the biggest statement your outfit is making. Some “statement” jewelry is really pretty, but I’d rather be the focus of my outfit instead of my necklace. You know, I want to wear my jewelry I don’t want it to be wearing me! Drop Earrings: I have long hair! And it’s wavy, which adds even more depth to it, so when I’m looking at earrings, I want something that’s big enough it won’t get lost in it. Studs are great because they’re lighter, but drop earrings can be seen. I like these oval ones because I’ve never found an outfit they don’t go with. They’re so versatile! A Leather Watch: I don’t think the metal watches will ever go out of style, but I feel like the leather ones are so much more casual, and most of my life is spent in casual clothing were I am currently in my life. It’s also softer, and doesn’t get caught on hair and loose knits. This one I saved for forever and is from Daniel Wellington. My Heirloom Ring: This ring is actually my great-great grandmother’s engagement ring. It was my high school graduation gift and it’s near and dear to my heart. I never take this thing off (other than when taking pictures of it apparently). I love rings but the bigger ones bother me when I’m working with my hands, so I have “two” rings I wear all the time, this one, and a small set of silver stacking rings. A Unique Non-Metal Bracelet: Metal bracelets clink on everything, and I can’t stand the noise. Leather bracelets, beaded bracelets, and this one are my choice. Can you guess what this braided wonder is made of? I bet you can’t! It’s horse hair, and even more impressive, my horses hair. I got this thing custom made for me one year and have been in love with it ever since. What is your jewelry go to? These are very special pieces. I love that you wear your grandmothers engagement ring and your horse’s hair as a bracelet. Thank you so much! I like when things I own have a story and are special. I think life is better when people love, love, love everything they own!